IOWA (Pre-convention average: Obama 45.3%, Romney 44.3%; current average: Obama 47.8%, Romney 46.5%) — Newspaper endorsements typically aren’t worth the paper they’re printed on, but sometimes — when they are unpredictable — they can have a measurable effect. That’s the way we feel about the Des Moines Register’s splashy endorsement of Mitt Romney on Sunday, its first GOP presidential pick since Richard Nixon in 1972. The endorsement — and, more importantly, the paucity of public polling in the state — lead us to call Iowa a TOSS-UP. 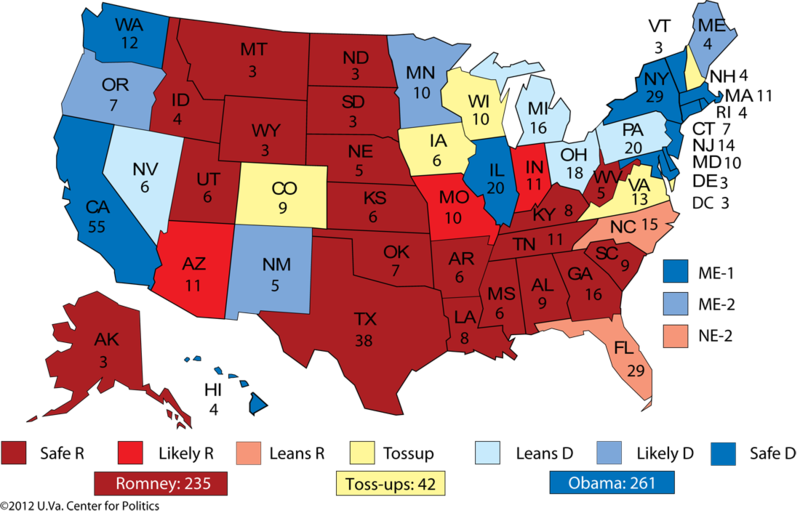 Notice we are not including Michigan, Minnesota, North Carolina, Oregon and Pennsylvania on this list, even though some insist that Romney is now broadening the map (Obama in the case of the Tar Heel State). Out of an abundance of caution, we are moving Michigan to leans Democratic. We continue to believe that the outcomes in these states are not very much in doubt (North Carolina should go to Romney, and the other four should go to Obama). 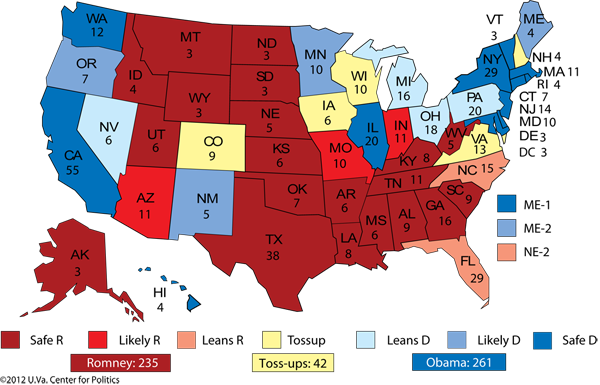 However, National Journal’s Josh Kraushaar, in an excellent column, crystallized something we’ve been thinking about: Given Obama’s weakness among white voters, it’s possible that a state like Michigan or Minnesota or Oregon could drift into Romney’s column if he ends up winning a solid national victory. “The election isn’t just coming down to Ohio,” Kraushaar wrote. “There’s plenty of evidence that, given Obama’s struggles with white working-class voters, he could face some unexpected headwinds in states that have been in the Democratic column during presidential years since at least 1988.” We might not go that far ourselves — we see the ad spending in these states as largely a sideshow — but in this very odd and wild election, it’s wise to consider all reasonable possibilities. Earlier we called the House for the Republicans. Now we are willing to call the Senate for the Democrats — as long as the presidential race doesn’t break heavily for Romney in the last days. 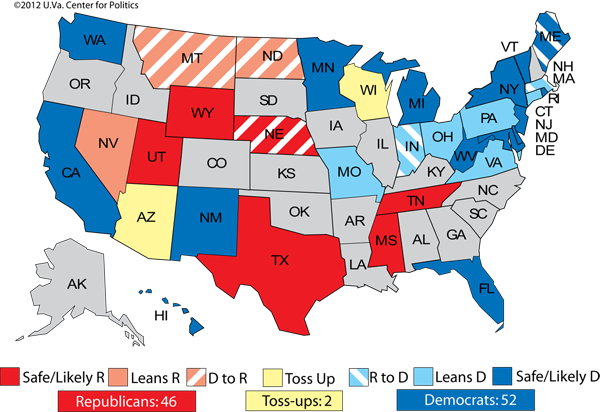 Our current Senate projection is 52 Democrats to 46 Republicans, with two leftover toss-ups: Arizona and Wisconsin. Here’s how the math works: 30 Democratic senators and 37 Republican senators are not up for reelection this year. In this year’s 33 contests, Democrats are likely or safe winners in 15 states: California, Delaware, Florida, Hawaii, Maine, Maryland, Michigan, Minnesota, New Jersey, New Mexico, New York, Rhode Island, Vermont, Washington and West Virginia. That includes two independents: Bernie Sanders of Vermont and Angus King of Maine, whom we have upgraded to likely Democratic/independent. (We are operating under the assumption that King will caucus with the Democrats.) Meanwhile, Republicans are safe or likely winners in Mississippi, Nebraska, Tennessee, Texas, Utah and Wyoming. Despite some recent tightening in Nebraska and Republican ex-Sen. Chuck Hagel’s expected endorsement of the Democrat, we don’t see ex-Sen. Bob Kerrey (D) beating state Sen. Deb Fischer in Republican Nebraska. 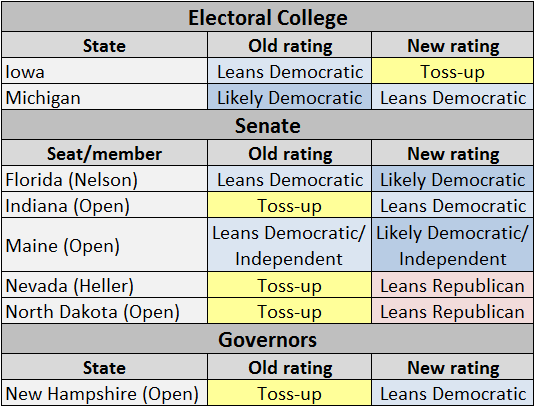 We’ll try to call the two toss-ups on Monday, and we might also revisit some of these other ratings — the squishiest “lean Democratic” seats are probably Indiana and Virginia, and the shakiest “lean Republican” seats are probably Montana and North Dakota. If we’re right in the Senate (small Democratic edge) and in the House (we will tweak some races Monday, but we do not expect the overall projection of Democrats +5 and solid overall GOP control to change much), and IF President Obama wins a second term, it is possible that we will have spent $6 billion or $7 billion on the 2012 campaigns in order to produce a status quo government, with each party controlling the pieces of the federal government they started with. Whether this would work any better the second time around, we’ll just have to see. We will try to pick Montana on Monday, and also potentially revisit New Hampshire and Washington. Depending on the call in Montana, Republicans would control 30 or 31 of the 50 statehouses, leaving them one or two short of matching their post-World War II high, 32 governorships, last achieved in 1998. 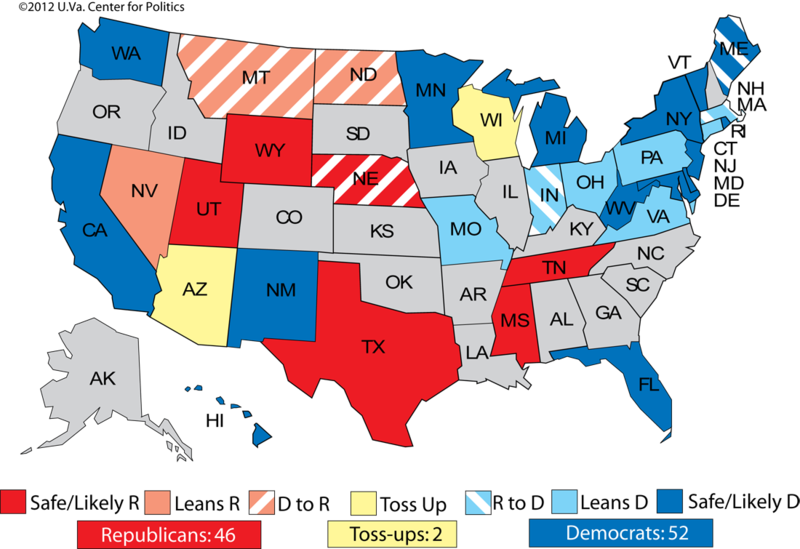 Earlier in the Crystal Ball, Tim Storey of the National Conference of State Legislatures examined the 6,034 state legislative seats up for grabs on Tuesday, and we’ll see substantial changes there, too. Look for our special, final Crystal Ball of the 2012 election season on Monday, where we plan to call all the remaining states and races in this utterly unforgettable election. It’s been a wild ride, and our overriding hope — for us, for you, and for the nation — is that the election doesn’t go into overtime with an inconclusive result.